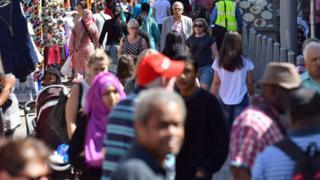 Black and ethnic minority people in Britain still face "entrenched" race inequality in many areas, including education and health, a watchdog warns. A review by the Equality and Human Rights Commission, which also looked at employment, housing, pay, and criminal justice, found an "alarming picture". Black graduates earn on average 23.1% less than white ones, and more ethnic minorities are unemployed, it found. The government said it was committed to "delivering real social reform". David Isaac, the commission's chairman, said the report reveals a "very worrying combination of a post-Brexit rise in hate crime and long-term systemic unfairness and race inequality". "We must redouble our efforts to tackle race inequality urgently or risk the divisions in our society growing and racial tensions increasing," he warned. "If you are black or an ethnic minority in modern Britain, it can often still feel like you're living in a different world, never mind being part of a one nation society." It underlines "just how entrenched and far-reaching race inequality remains", he said. Poorer white communities also face "continuing disadvantage", the report added. The commission acknowledged there had been progress in some areas, citing an increase in the number of ethnic minority MPs and a rise in the proportion with a degree-level qualification across all ethnic groups. But Mr Isaac said the government's strategy in recent years has been "piecemeal and stuttering". He called for the government to introduce a comprehensive race equality plan "to build a fair society in which our origins do not determine our destinies". The commission recommended that responsibility for the strategy be brought under one secretary of state. New targets to improve opportunities and outcomes for ethnic minority communities should be introduced, it added. The government said "real progress" was being made - with black and ethnic minority employment rates at their highest levels for 15 years. "But there is clearly more to do, which is why we are delivering a comprehensive race equality programme on employment, university places, apprenticeships, start-up loans and recruitment to the police and armed forces," a spokeswoman added.